Today we finished prepping the new perennial bed that is in the front of our house. I'm all for removing lawn and replacing it with a xeriscape-bed. Not only do I love that style, but I really hate mowing. Our house before had grass coming up to the deck that was flanked by two small ornamental beds with gravel as a mulch. We removed the gravel and put down some of the local free bark mulch. Here are the before and after shots. Try to imagine the after shot with sunny blue skies and green grass. It's hard to tell in this picture, but the bed extends out from the deck by about 8 feet or so. That makes for a lot of room to fill up. However, I'm going to keep plantings fairly sparse the first year or two since we've still got the puppies to deal with. My plan so far is to plant a butterfly bush or two (next to the window on the right and on the left side of the bed perhaps? 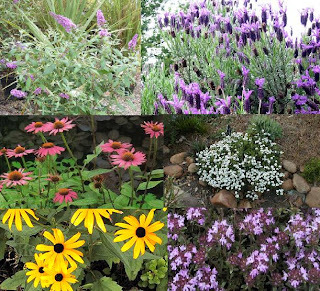 ), and then some groupings of purple cone flowers, black eyed susans, lavender and maybe some thyme or candy-tuft. These plants should all be fairly low maintenance as far as watering and I'm hoping a little bit deer resistant. If anyone has comments/suggestions about other plants to consider that might be lower maintenance or more deer resistant I am very open to feedback! Our front garden is xeriscaped. Some plants we love are centranthus (it spreads), any penstemon, perovskia (russian sage), winecups, gaura (another spreader), agastache and desert four o'clocks. We have found that deer will eat anything if they are hungry enough including our cone flowers. They don't like irises which we have a lot of and the lavender you mentioned. I've also planted Yarrow to keep them out but it gets kind of wild looking. Mom- I'll take anything you bring out. Lynda - how close have the deer come to your house to eat your plants? We've seen deer on our property, but always 15-20 feet from the house at a minimum. I really love your house, so much light. I wish we were set up with more windows and sunlight to help with our seed starting ventures. I like your flower ideas and would only suggest adding a few simple herbs such as thyme, oregano, and winter savory. The deer do not seem to bother ours...yet anyways. You asked how our potting mix was working out and I thanked you for the link, really interesting. So sorry I missed your comments from the other day. Anyway, our potting mix is about 1/4 ant nest, 1/4 moss, and the rest is composted soil. It is working out really great, holding moisture well, and the plants seem to be thriving. I did an acidity test on it and was very surprised to find it to have a neutral ph just like the article you shared with me suggested. I think it will be a great addition to your compost. 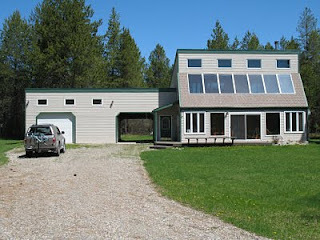 Your house is really cool, unlike any house I have seen and I have seen a lot of houses. Sounds like a big project doing your landscaping but it'll be worth it in the long run. Deer even ate some of our camellias this winter. Thanks Randy, we think the house is pretty cool too. 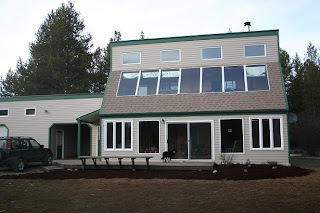 I'll do a post in the next few weeks about how the passive solar heating in the home works with some pictures. The landscaping is definitely a huge undertaking, but we're both ready for some hard work. We've been dreaming about this for years and are thankful we can finally make our dreams a reality.